On the surface, Direct Mail vs. Google Adwords seems like an odd comparison. To be sure, these are two very different types of marketing programs. Direct mail is traditional offline marketing. Google Adwords is the cornerstone of online marketing. But they are also very similar. Both are very accessible to small businesses and tight budgets. And both are fully accountable meaning you can track and measure your results in a variety of ways. So which approach makes sense for you? Direct mail? Google Adwords? Or both? Direct mail is well known as a traditional marketing tactic allowing you to target and reach out to individuals who fit your customer profile. Multiple formats – letter packages, postcards, self-mailers – are available in a variety of sizes. There are no minimum requirements with direct mail, although larger quantities provide a significant discount in unit costs. Pricing ranges from 60 cents to $1.00 per piece depending on the format and the quantity. 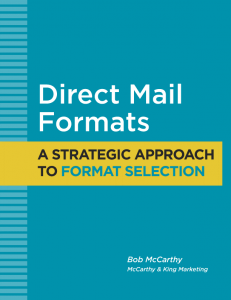 With direct mail, you invest upfront in your campaign, and then you wait for the response. In most cases, the responses are leads – not orders – so you will need to have a follow-up strategy in place. Google Adwords is Google’s main source of revenue. It is platform that uses a pay-per-click (PPC) model – meaning that advertisers only pay when someone clicks on their ads. What you pay per click will vary by industry and the type of program you are using. It can range from a few cents to several (or many) dollars per click. What you pay is based entirely on what you are willing to bid. In some industries, the bid for Page 1 placement is very high. But you can get to the top of Google very cheaply in other industries. Google Adwords can be set up to target any audience segment (business and consumer) at any location (down to the zip code or a radius from a store location). It should be noted that Google isn’t the only player here. There are other search engines (Bing, Yahoo) and a wide range of advertising networks that use the same model for their advertising clients. With Google, you pay nothing up front. You only pay when someone shows an interest in your ad. 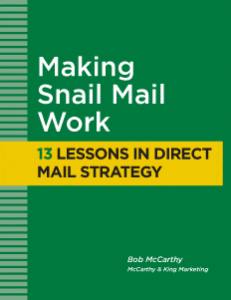 If you’re familiar with my view on marketing, you know that I don’t like to sell direct mail. I like direct mail and I recommend it often. I believe it is a very effective marketing tactic for many businesses. But it’s not for everyone and it certainly isn’t the only marketing tactic out there. What I do believe and what I do sell, however, is the concept of direct response. I believe all marketing needs to be developed for direct response. Whether you’re using direct mail, online advertising or traditional offline advertising, there is no justification for not using direct response. You’re investing in your marketing. You should expect a measurable return on that investment. Moreover, if you’re not using direct response, you can’t track or test different components of your marketing. You’re flying blind most of the time. And that’s not something a smart marketer should want to do. 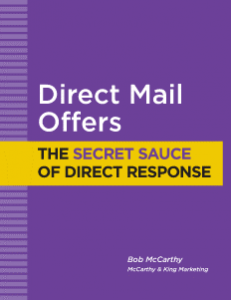 With little exception, the vast majority of direct mail campaigns are designed for direct response. With Google Adwords, it’s all direct response. In fact, you could say that Google Adwords is the ultimate direct response tool. Obviously whenever you compare direct mail with any form of advertising, there is a significant difference in targeting. Direct mail reaches individuals you’ve identified as prospects. Advertising reaches groups you’ve identified as prospects. But with Google Advertising, the difference is a bit more nuanced. Are these people a good fit for my product or service? This is generally what you are trying to determine with your list research or media selection. Do they currently have an interest level in my product or service? For the most part, list research and media selection can’t answer that question. The campaign itself should help you identify interest level. With direct mail, you should be able to find the people with the right fit. 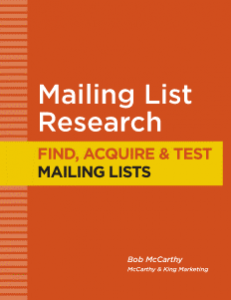 You create a customer profile and then find mailing lists that match that profile. Assuming you have done a good job defining your customer profile, you have a good chance of reaching qualified prospects through direct mail. With Google Advertising, the three programs each reach your target audience differently. With Google Search, you are reaching people who are searching for information about your product/service or company. This means they have a high interest level. With Google Display, you are reaching people who match your customer profile, but not with the specificity of direct mail. There is no interest level shown here until they respond. With Google Remarketing, you are reaching people who have recently visited your website. This means they have a high interest level. But what none of these Google programs can give you is a pre-qualified response. Although they show interest, you have no way of knowing whether they fit your customer profile. To use a B2B example, are they from the right industry, the right company size, the job title, the right geography? Are you getting clicks from competitors? You can, however, answer these questions and pre-qualify your response with direct mail. When you move into Google Display or Remarketing, you can stay with text ads, but you also have the option to create more visual display ads. Google offers 14 different size options. For this, Google has a tool to help you create your own display ads, but it has its limits. It’s better to create your own ads to their specifications. Direct mail, on the other hand, is a more complex process. Even the simplest format, a small postcard, is going to require work from a copywriter and a graphic designer. A letter package needs to be written, with less emphasis on design. 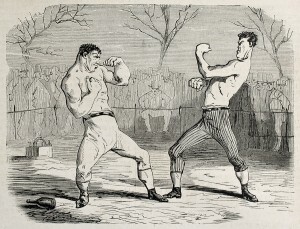 Larger formats may require extensive writing and design. When you add it all up, direct mail is going to cost you somewhere between 60 cents and $1.00 per mail piece to get out the door. A beginning mailing is likely to run between 2,000 and 20,000 pieces, but of course, you can mail just one piece if you want. Do the math and you can see what your entry costs might be. With Google Advertising, you can get started on just a few dollars a day. Let’s look at Google Search specifically. Every industry is different, but let’s say you can get on Page 1 of Google for a bid of $1 per click. If you establish a daily budget of $5, you could generate as many as 5 clicks per day. Of course, not all clicks become leads. Many people (actually most people) will click through to your landing page (or website) and do nothing. They will leave without taking any action – which can be very frustrating because you paid for that click. Don’t be surprise if your conversion from click to lead is as low as 5-10%. Again, do the math. If you’re paying $1 per click and you are converting 10% into leads, your actual cost per lead is $10. You could write a letter this morning and drop it in the mail this afternoon. You could do 10 letters or even 100 letters on any given day. But if you’re running a direct mail campaign, you’ll need a little more time to prepare. There’s writing and design, list preparation, printing, addressing, inserting and delivery to the post office. And that generally takes a few to several weeks. And don’t forget delivery times. Compare that with Google Advertising. After you set up your campaign, your advertising starts as soon as Google approves your ads. This could take an hour (if you’re an established account) or a day or two (if you’re new). Your ad exposure (impressions) will start slowly and expand over time. The key to Google Advertising is the click – so what happens when someone clicks on your ad? For some advertisers, the prospect is taken to the company home page, but a much better approach is to take the prospect to a dedicated landing page. 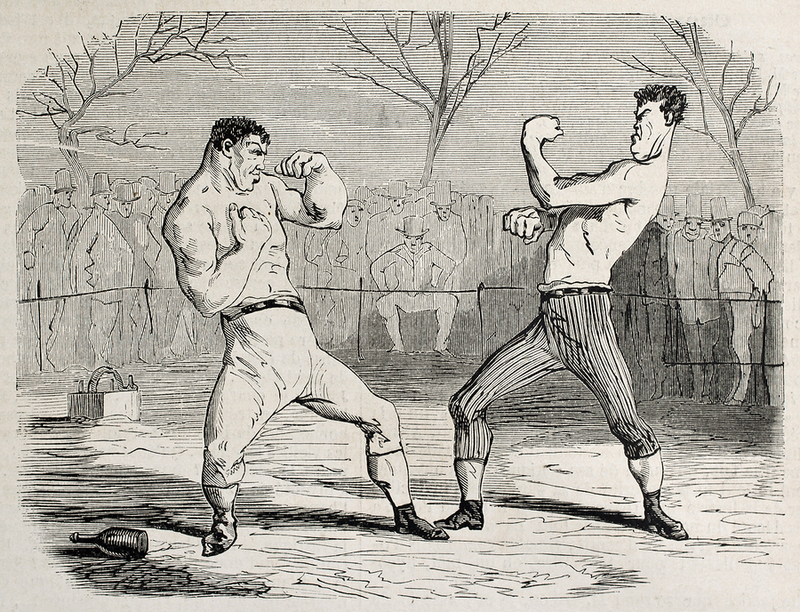 Your landing page has the challenge of converting a click into a lead. This is not easy. It may take some testing and tweaking to get it right. Don’t overlook this step. Landing pages can be hosted on your own website or on a 3rd party landing page service (which gives you more flexibility). Google also offers phone call response in addition to, or instead of, clicks. When someone is searching on a mobile phone, for example, they might be given a “click to call” option. These calls are treated the same way as clicks. In direct mail, we also use landing pages to capture leads. Sometimes we personalize the landing pages with something called pURLs. With pURLs, the landing page is unique to each person being mailed. When prospects type in their unique URLs, they are taken to their own landing pages where their personal information is already populated. Further, with direct mail, response is also available by phone, fax and reply mail. Some direct mail users have dropped the reply card from their packages in favor of the landing page. In our view, this is a mistake. Reply mail is still a viable option and preferred by many prospects. There is little justification for dropping this component. Sad to say, this is a much overlooked part for both marketing tactics. During my years in direct mail, I can’t tell you how many campaigns I’ve worked on that had little to no follow-up strategy. Responses (leads) were almost always turned over to sales for a quick qualifying phone call but with no other plans for follow up. Now with email, more companies are building in email newsletters and drip email sequences to stay in touch with their leads over an extended time period. Follow-up direct mail is still a good idea, but for many companies, it’s not a high priority. For Google advertisers, it should be understood that most leads are not ready to buy today. Search Advertising leads are more likely to buy sooner than later (after all, they were searching when they saw your ad), but Display and Remarketing Advertising will produce more long-term leads. Keep in mind too that Remarketing Advertising will keep your message in front of everyone who visits your site – whether they converted to a lead or not. This creates almost a built-in follow-up program for you. You might expect that I came to this discussion with a heavy preference for direct mail. After all, I have long history in the direct marketing industry. But I have learned to appreciate the power of all measurable marketing across all channels – and Google Advertising brings a new level of accountability to marketing. I like Google Advertising a lot – and I recommend it to many clients, especially those who are unable afford to invest adequately in direct mail. Google Advertising is one of the best ways to test different aspects of your marketing on a very limited budget. You can then use the results to invest more in your Google Advertising program – or even apply those results to other programs including direct mail. But when you know your target market, when you can identify your potential customers with precision, nothing beats direct mail. Learn more about our Direct Mail and Google Advertising programs. Nice read Bob! Very nice general review. My recommendation has always been to use the two in tandem, as direct mail can enhance your brand and keyword awareness, which in turn will help drive your search efforts. The question I like to ask is if search engines didn’t exist ( just play along) would a customer know about your business? I agree with you that your entry level cost for Google Search are pretty much determined by your industry and the bids of your competitors. Thanks for sharing this great article.